Aim: This study aims to objectively assess the dentition status in South Indian postmenopausal women and compare the dental health of osteoporotic participants with nonosteoporotic individuals. Materials and Methods: A total of 150 consecutive ambulatory South Indian postmenopausal women (>50 years of age) were assessed for their dental health using an internationally validated scoring system. Bone mineral density (BMD) was assessed using a dual-energy X-ray absorptiometry scanner. Results: About 39% of the participants were found to have osteoporosis and 23% had osteopenia at any site. More than half of them (57%) had poor dental health, and the predominant problems were cavities (43.5%) and loss of teeth (75%). Among 112 women who had tooth loss, the mean tooth loss was 4.8. The mean tooth loss among patients with normal BMD was 1.09 ± 1.2, in osteopenia was 2.1 ± 2, and in osteoporosis was 5.4 ± 2.8 (P < 0.01). The odds of having osteoporosis among the patients with three or more tooth loss were found to be 4.2 (95% confidence interval = 2.4–7.3). Conclusion: Postmenopausal women with osteoporosis had significantly higher number of tooth loss. Tooth loss may thus be used as a surrogate marker to predict osteoporosis. Osteoporosis is a common metabolic bone disorder and is an important cause for increased morbidity and mortality in postmenopausal women and elderly men. Previously published data from our center suggest that 50% of women (above 50 years) and 45% of men (above 65 years) have osteoporosis., Based on the 2011 census, about 140 million Indian women were above the age of 50, and this figure is expected to rise further. The gold standard in the diagnosis of osteoporosis is the assessment of bone mineral density (BMD) using a dual-energy X-ray absorptiometry (DXA) scanner. However, the restricted availability of DXA scanners in India (<400) as well as the lack of portability and high costs incurred make it inaccessible to the majority of older women in rural and suburban areas. Osteoporosis at femoral neck may result in hip fracture, the mortality of which has been reported to be as high as 33%., The high costs involved in the management of osteoporosis and its complications are not just limited to the initial hospitalization after fracture but also to rehabilitation and home care. These exorbitant costs warrant good preventive and early diagnostic strategies which will probably overcome the problems of limited availability of DXA scanners in our country. Hence, there is a definite requirement of the novel, innovative, and cheaper clinical alternatives to screen for osteoporosis. The assessment of dental health is one such alternative which may be reflective of the underlying osteoporosis. At present, there is limited information available (none from India) on the relationship between osteoporosis and dental health. Further, well-controlled studies are definitely required to better clarify the interrelationship between systemic and oral bone loss and to determine whether physicians could use dentition as a proxy indicator for underlying osteoporosis. In this study, we aimed to objectively assess the dentition status in postmenopausal women and compare the dental health of osteoporotic participants with nonosteoporotic individuals. This was a cross-sectional study that was conducted over a period of 6 months at a tertiary care center in Southern India. Written informed consent was obtained from each individual. This study was approved by the IRB before its commencement (IRB Min No: 9269 dated 12.01.2015). Consecutive postmenopausal women above the age of 50 years were recruited from the community and assessed for dental health and osteoporosis. Dentition was assessed by an internationally validated scoring questionnaire system [Table 1]. A composite score of ≥6 reflected poor dental health. 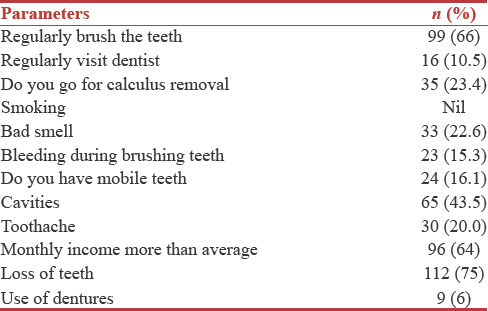 The percentage of participants who brush their teeth at least twice a day, visit the dentist once a year, undergo removal of calculus annually, do no smoke, never bleed on brushing their teeth, have no mobile teeth, have no toothache, have no bad smell, and have monthly income more than average was calculated. In addition to the questionnaire, other data to assess the number of teeth lost and use of dentures were also obtained. Overall, 12 parameters with regard to dental health were assessed. BMD of the lumbar spine and femoral neck was measured using Hologic DXA machine (Discovery A-QDR 4500). The patients who were using tobacco, those on bisphosphonates or other forms of treatment for osteoporosis, and people with secondary osteoporosis were excluded to homogenize the sample. The patients were divided into three groups – normal, osteopenia, and osteoporosis – depending on their BMD. This division was based on the current WHO diagnostic criteria for osteoporosis in which a T-score of –2.5 or below was diagnosed as osteoporosis, a T-score between −1 and −2.5 was considered osteopenia, and a T-score ranging from −1 to +1 was considered normal. The CV of BMD measurement at both sites was about 2%. Based on a previously published study, the minimum sample size calculated was 60 per group (60 with osteoporosis and 60 without osteoporosis). SPSS 16.0 for Windows (R) 2007 SPSS Inc. - Microsoft Corp. (USA) was used for statistical analysis. One hundred and fifty postmenopausal women above the age of 50 years were enrolled in the study. The mean (standard deviation [SD]) age of the study participants was 55 (5.5) years, and their mean (SD) BMI was 25.3 (4.3) kg/m 2. Osteoporosis (at any site) was present in 39.1% of the participants. The assessment of dental health [Table 2] revealed dental cavities in 65 participants (43.5%), which was the most common dental problem. Tooth loss was present in 112 (75%) women, and among them, the mean tooth loss was 4.82 and the median tooth loss was 3. The participants were further divided into three groups based on their BMD (osteoporosis 59 [39%], osteopenia 34 [23%], and normal 57 [38%]). It was found that those participants with osteoporosis had significantly higher number of tooth loss (5.4 ± 2.8) as compared to those with osteopenia (2.1 ± 2) and normal BMD (1.09 ± 1.2) (P < 0.01). About 57% of participants (n = 86) were found to have poor dental health with a composite score of ≥ 6. The composite dental score was not significantly different between three groups (7.58 ± 2.61 in osteoporosis, 6.81 ± 2.67 in osteopenia, and 7.63 ± 1.9 in normal [P = 0.8]). The odds of having osteoporosis among the patients with three or more tooth loss were found to be 4.2 (95% confidence interval = 2.4–7.3; P < 0.01). In this study of 150 postmenopausal women, two-fifths of them were found to have osteoporosis at any site. It was also noted that over 50% of the study participants had poor dental health and the predominant problems were cavities and tooth loss. The mean tooth loss was significantly higher in those participants with osteoporosis when compared to those with normal BMD. Likewise, the odds of having osteoporosis among the patients with three or more tooth loss were found to be 4.2. In our study, the prevalence of osteoporosis in postmenopausal women was 39%, which is similar to other studies conducted in India. However, it was found to be slightly lower than other data from our center probably because of the lower mean age of participants in the present study. Tooth loss in osteoporotic women may be caused by both local and systemic factors. Osteoporosis is one of the most plausible systemic causes of tooth loss, but its clear association has been challenging. This is due to multifactorial etiologies proposed for tooth loss and the diverse criteria used to define osteoporosis and periodontitis. A few studies have demonstrated periodontitis as an early warning sign of osteoporosis. At present, no published Indian study exists to furnish this data in our setting. Among the prospective studies published in the west, Yoshihara et al. found a positive correlation between BMD measured by calcaneal ultrasonography and dental loss. In another study of 30 postmenopausal women, an average tooth loss of about 16.5 was found in those with osteoporosis, 10.5 in osteopenia, and 6.8 in those with normal BMD. These figures are higher than what was found in our study. In another study by Miley et al., 51 participants who received calcium and Vitamin D supplements showed improvement in periodontal disease. This suggests that treatment of osteoporosis may reduce the risk of tooth loss in these individuals, which further reinforces our hypothesis. This is the first study from Southern India that has attempted to utilize surrogate markers in identifying postmenopausal women at risk for osteoporosis. With the enormous burden of osteoporosis, compounded by the limited availability of DXA scanners, the assessment of dentition proves to be a cost-effective and simple strategy that may assist in the triage of women at high risk for osteoporosis and consequent fractures. In a resource-constrained setting, primary care physicians and village health workers can resort to such simple clinical examination methods which would enable stratification of women at risk for osteoporosis. Our study is not without limitations. As the sample size was small and only women were included, this may not be applicable to the community at large. Further prospective studies are required to validate these findings in future. Osteoporotic women had significantly a higher number of tooth loss than those with osteopenia or normal bone density. This study suggests that tooth loss may be used as a surrogate marker to predict osteoporosis. Shetty S, Kapoor N, Naik D, Asha HS, Prabu S, Thomas N, et al. Osteoporosis in healthy South Indian males and the influence of life style factors and Vitamin d status on bone mineral density. J Osteoporos 2014;2014:723238. Paul TV, Thomas N, Seshadri MS, Oommen R, Jose A, Mahendri NV, et al. Prevalence of osteoporosis in ambulatory postmenopausal women from a Semiurban region in Southern India: Relationship to calcium nutrition and Vitamin D status. Endocr Pract 2008;14:665-71. Registrar General I. Census of India 2011: Provisional Population Totals-India Data Sheet. Office of the Registrar General Census Commissioner, India. Indian Census Bureau; 2011. Paul TV, Selvan SA, Asha HS, Thomas N, Venkatesh K, Oommen AT, et al. Hypovitaminosis D and other risk factors of femoral neck fracture in South Indian postmenopausal women: A Pilot study. J Clin Diagn Res 2015;9:OC19-22. Forsén L, Sogaard AJ, Meyer HE, Edna T, Kopjar B. Survival after hip fracture: Short- and long-term excess mortality according to age and gender. Osteoporos Int 1999;10:73-8. Braithwaite RS, Col NF, Wong JB. Estimating hip fracture morbidity, mortality and costs. J Am Geriatr Soc 2003;51:364-70. Martínez-Maestre MÁ, González-Cejudo C, Machuca G, Torrejón R, Castelo-Branco C. Periodontitis and osteoporosis: A systematic review. Climacteric 2010;13:523-9. Levin L, Shpigel I, Peretz B. The use of a self-report questionnaire for dental health status assessment: A preliminary study. Br Dent J 2013;214:E15. Mohammad AR, Hooper DA, Vermilyea SG, Mariotti A, Preshaw PM. An investigation of the relationship between systemic bone density and clinical periodontal status in post-menopausal Asian-American women. Int Dent J 2003;53:121-5. Mithal A, Kaur P. Osteoporosis in Asia: A call to action. Curr Osteoporos Rep 2012;10:245-7. Yoshihara A, Seida Y, Hanada N, Miyazaki H. A longitudinal study of the relationship between periodontal disease and bone mineral density in community-dwelling older adults. J Clin Periodontol 2004;31:680-4. Miley DD, Garcia MN, Hildebolt CF, Shannon WD, Couture RA, Anderson Spearie CL, et al. Cross-sectional study of Vitamin D and calcium supplementation effects on chronic periodontitis. J Periodontol 2009;80:1433-9.